Role and Interceptors Area and theater missile defense, upper tier of Israeli layered missile defense; Arrow-2—two-stage solid-propelled rocket with 90 km range and 50 km altitude ceiling tipped with a direct fragmentation warhead;[i] Arrow-3—two-stage solid-propelled rocket with kinetic hit-to-kill warhead. The Arrow project began in the 1980s when its design was submitted to the United States in response to President Regan’s Strategic Defense Initiative. [v] The system was promoted as a more effective theater missile defense system than the Patriot air defense platform. After a successful demonstration test, the system, called Arrow-1, underwent full-scale development and pre-production with joint funding from the United States and Israel. [vi] The original Arrow-1 interceptor had two stages, used solid-fuel, and was designed to intercept short-range ballistic missiles such as Scuds. 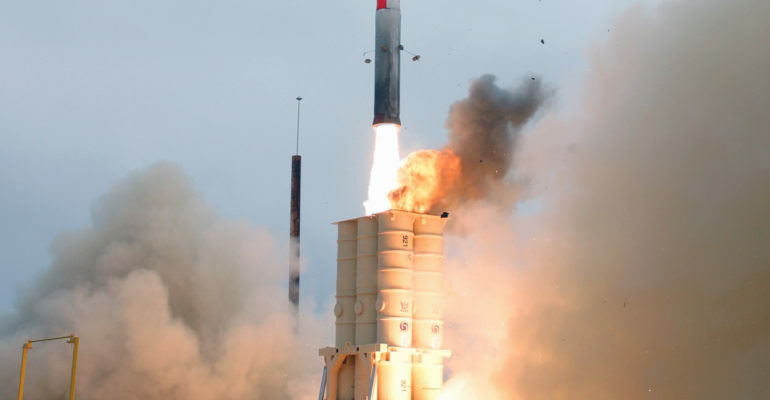 [vii] Arrow not only provides Israel with much-needed ballistic missile defense in a hostile region, but also offers valuable technical information for the United States that can be utilized to progress U.S. and allied BMD capabilities. The Arrow missile defense platform consists of multiple systems to identify, track, and intercept ballistic missile threats. The missile defense system consists of high-altitude interceptors housed in mobile launchers and equipped with interceptors that track ballistic missile threats and engage them in the terminal phase of flight. Arrow functions in conjunction with Green Pine long-range, ground-based fire control radar, which is a transportable solid state phased array radar with a range of approximately 500 km. [x] To control the Arrow system and its engagements, a mobile Citron Tree battle management center is employed. [xi] All system components for Arrow are mobile or semi-mobile, allowing the entire missile defense system to easily relocate to avoid preemptive strikes. Overall, the Arrow-3 system weighs less than half of Arrow-2 and is subsequently more advanced in speed, range, and altitude than its predecessor. [xv] Unlike Arrow-2, Arrow-3 is capable of exo-atmospheric ballistic missile intercepts in space[xvi], and instead of a fragmentation warhead, the upgraded interceptor uses hit-to-kill technology to destroy targets with kinetic energy. In addition, the new Arrow interceptor will include upgraded communications, guidance, and sensor systems and is interoperable with Arrow-2 launchers; minimizing cost and maximizing efficiency. This advanced upper-tier missile defense system established initial operational capability (IOC) on January 18, 2017. Israel’s geographic location means the country is constantly at risk of ballistic missile attack. 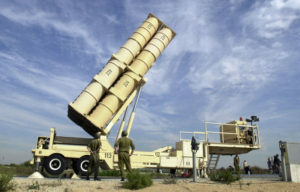 When the Israelis began development of Arrow in the 1980s, the primary missile threats to Israel came from Iraq, Iran, and Syria. Subsequently, the Arrow project was undertaken as a collaborative U.S.-Israeli effort to counter these numerous missile threats to Israel. 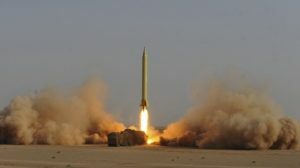 Currently, Iran stands as the primary ballistic missile threat to Israel and possesses a sophisticated and perpetually advancing arsenal of short- and medium-range ballistic missiles. In conjunction with Iran’s ballistic missile capability is the country’s nuclear breakout potential, open threats of annihilation towards Israel, and continued support—including provision of ballistic missiles—for terrorist organizations such as Hezbollah. [xviii] In light of the growing Iranian short- and medium-range ballistic missile threat, the importance of the Arrow program has grown significantly. January 22, 2019: The IMDO and MDA successfully completed a test of the Arrow-3 interceptor. January 18, 2017: Arrow-3 became operational and was transferred to Israeli Air Force Aerial Defense Array. February 22, 2011: Arrow successfully intercepts ballistic missile during flight test at Pt. Mugu Sea Range, California. [xxi] The test was designed to replicate a realistic scenario in which all the system elements—including Arrow, Green Pine radar, and Citron Tree BMC—worked together to identify, track, and intercept a target missile. 2008: Joint U.S.-Israeli development on Arrow-3 was initiated.